Guess what? I'm in love with birthdays. I love how it's a holiday that is super personal and can't be overly merchandised. I love that there is one day a year that I can have permission to spoil a friend or even an acquaintance. I can honestly say that birthdays are my favorite holiday; I even look forward to it more than Christmas. I'm not sure if it is selfish or not, but I really love my own birthday too. The whole day feels magical to me. I have very clear memories of most of my birthdays, even ones that weren't over the top exciting. One of the things I love about it is that I love to make a treat that's extra special to share with my coworkers and family. This year, I decided to hold out and make The New York Times Chocolate Chip Cookie recipe that everyone went nuts over back in July. Being a big fan of Jacques Torres, I was very intrigued to try this cookie - I had made his original recipe last year as a gift and thought those cookies were pretty darn good. How much better could these be? The answer: a lot! I stayed true to the recipe as much as I could. Since Scharffenberger chocolate only comes in one pound boxes, I only used two pounds of it instead of the two and a half pounds the recipe called for. Maybe it was because I made a much smaller cookie, but honestly, with just the two pounds, it seemed like too much chocolate but I really liked the combination. My only other change was using vanilla paste for one of the two teaspoons of vanilla. I only did that because I ran out (the horror!) of vanilla. I also opted to make a smaller cookie. I used a 1 oz cookie scoop (ping pong sized ball of dough) instead of the golf ball size the original recipe called for. Big cookies are fun too, but I like a cookie that I can eat in a bite or two. If you're going to make these cookies, please spring for the really good chocolate. While Hersey's, Baker's, and the other chips that you can buy in the store are good (I use them all the time), something magical happens to the flavor of the cookie when you use really high quality chocolate. It's seriously worth it. Oh and don't forget the sea salt. I know it sounds scary and strange to put salt on a cookie right before you put it in the oven, but it's only a teeny tiny amount. I made a dozen with and without the salt and the cookies that were salted really did taste better. When ready to bake, preheat oven to 350F degrees. Line a baking sheet with parchment paper or a nonstick baking mat. Set aside. Scoop 12 1-ounce mounds of dough (the size of a ping pong ball) onto baking sheet, making sure to turn horizontally any chocolate pieces that are poking up; it will make for a more attractive cookie. Sprinkle lightly with sea salt and bake until golden brown but still soft in the middle, 9 to 11 minutes. **They will continue to bake after you take them out of the oven. If they look slightly shiny in the center of the cookie, but slightly brown on the edges, they are done. Be careful not to over bake them! 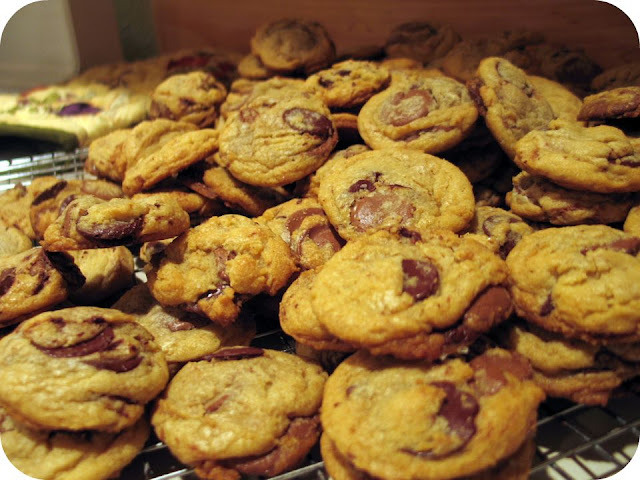 ** Transfer sheet to a wire rack for 10 minutes, then slip cookies onto another rack to cool a bit more. Repeat with remaining dough or reserve dough but keep it refrigerated for baking remaining batches the next day. Eat warm, with a big napkin. Wonderful recipe! I just discovered your blog and made the chocolate chip cheesecakes bars this weekend. Fantastic! Thanks for all the great recipes and photos. I'm a regular stalker, now!!! Happy Birthday!!! :) I've been wanting to try this recipe. I'm glad you reminded me of it! Enjoy the rest of your birthday month!!! wow, those are beautiful! the chocolate looks soo mouthwatering! i've been wanting to thy this recipe! Hey, you gotta tell your friends about your birthday! Mama Mia! :-) Yup, that was me singing to you! I'll forgive you this year for not telling me about your birthday but I need to know which day EXACTLY is your birthday! Your cookies came out fabulous! I personally love the mini size! These cookies really are incredible--the perfect thing to celebrate a birthday, I'd say. i left you a little blog award, come grab it when you have a minute! Beautiful cookies, hope you had a wonderful birthday! Julia, happy belated birthday! Em a silent reader of your fantastic blog but have yet to try any of your recipes but i do wish to try this delicious looking cookies..but i have some questions. 1. Can i just use self rising flour and omit the baking powder and baking soda? 2. Why the need of both baking powder? Can't i just use either one?? Saw your comment on my blog: Yes, you can definitely find the coconut-milk "yogurt" at Whole Foods. Hi Leila! Regarding your questions, I would not recommend changing anything about this recipe, just so you can experience the recipe as it was meant to be made. However, using all purpose flour will still turn out a great cookie. As for the combination of baking powder and baking soda? I'm no chemist, but due to all the positive reactions I received for these cookies (folks came back for 4th and 5ths! ), I'd strongly encourage you to just try the recipe as it was written. Don't skip anything or change anything (except for many the size of cookie). I'd stick to the original recipe. 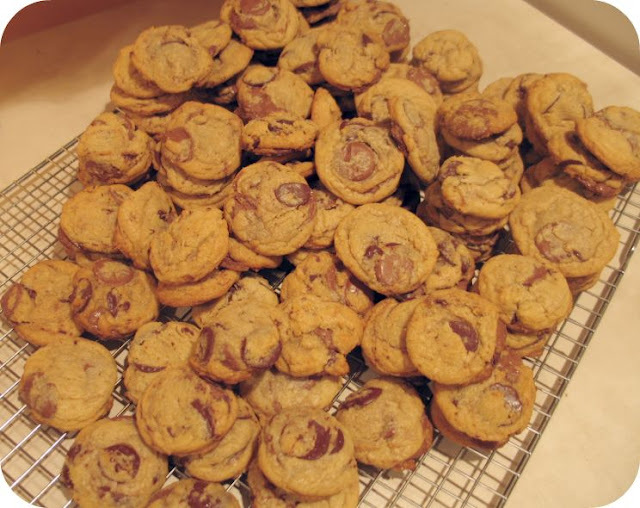 If you don't want to use both, perhaps you'd like the King Authur Flour Chocolate Chip Cookie Recipe instead. It might be a better match for you due to its use of all purpose flour and only baking soda. Happy Belated Birthday. With all that chocolate how could you go wrong? YUMMY! 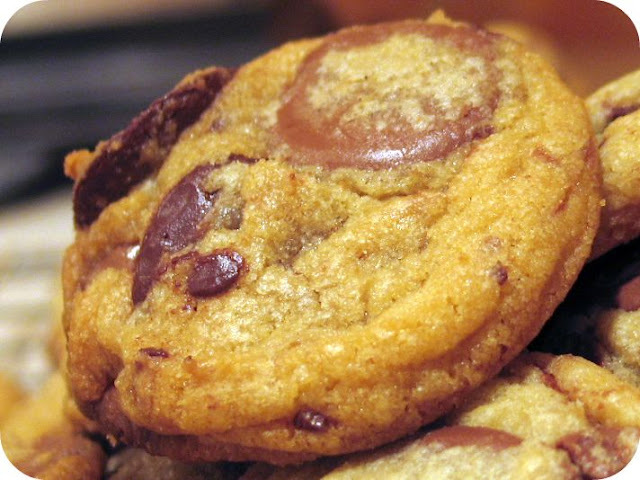 Seriously, those pictures have me craving a cookie right now, they look so good! Looks fabulous! I was wondering what you mean when you refer to using better quality chocolate, can you share what brands/kinds I should be looking for to make this recipe just heavenly? thank you so much!